Provides a dashboard overview of project and contract status, project details (including daily activity), financial and performance tracking, and material usage. The user can keep track of overall trends and progress that provides detailed information about a specific contractor or project at a touch. SOR PTS is powered by a real-time, web-based application via the web browser on your PC, Macintosh, iPad, iPhone, or Android smartphone. It's an anytime, anywhere solution for project tracking. Contactors can use SOR to perform full-cycle project management, from BOQ to final claim. Our web-based software reduces paperwork while increasing efficiency, allowing contractor personnel to spend more time on the job site by cutting down the amount of time spent on project documentation and billing by up to tenfold. The system revolves around daily activity records, with all reports and material usage calculated automatically. Put simply, it means more productivity and more efficiency for contractors. The main contractor software is web-based, with management tracking functions available through SOR Mobile, on iPad, iPhone, or Android smartphone. 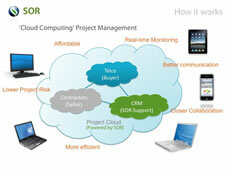 SOR is Software as a Service (SaaS) that stores project data in a "cloud". This drives performance and improves effectiveness and efficiency as both the contractors (seller) and principal (buyer) have access to integrated real-time data for monitoring, tracking and collaboration. Allows for real-time monitoring on project status and critical job alerts via SOR Mobile, email and/or SMS. This facilitates quick response to possible problems long before they can become critical and affect delivery. Automated documentation and administration reduce site supervisor/engineer desk hours by up to tenfold, allowing more time to be spent on-site instead. A 360-degree view provides powerful material tracking from order to delivery while including key details such as collection point, job usage and return of excess materials. This raises transparency, minimizes human error and increases material management capability through a simplified material administration method. Improves communication and fosters closer working relationship between buyer and client. Shortens execution time and minimizes occurrences of cost overrun. Deliver projects on time, on budget always. © 2007-2016 SOR SYSTEM SDN BHD. All Rights Reserved.